When the crowds of Yellowstone National Park dwindle as the earth is covered in a striking blanket of white; a dramatic environment of fire and ice remains. An adventure into this place known as “Wonderland” in the winter time is other-worldly. 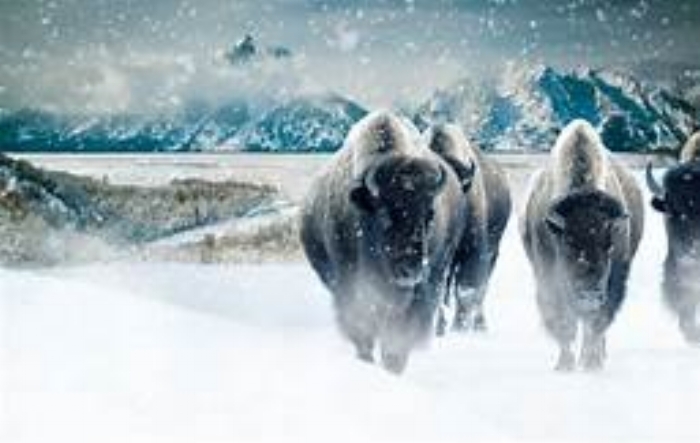 Bison, elk and wolves all endure the wrath of Mother Nature as they wander through the snow covered valleys. The geothermal features are simply jaw dropping in this frigid environment with billowing clouds of steam rising in every direction, waterfalls stand frozen in time as if by magic, and the water of geysers erupts into the brisk air instantly transforming into diamond dust twinkling as it falls back to the ground. With over four million visitors a year, the majority of which traveling in the summer months, some of the Yellowstone charm can be taken away by the sheer crowds of people. The most refreshing aspect of winter in Yellowstone for me is the silence and solitude. A visitor gets to experience this place like it was meant to be, like one of the first explorers discovering this enchanting area for the first time. Taking a Yellowstone winter tour gives you the chance to experience the raw power of Mother Nature. This place can be brutal, beautiful, and captivating all in one; a place where super-heated water erupts into arctic air and where wildlife pushes snow in a constant struggle to survive. Yellowstone in winter is a place where silence and solitude dominate the Parks interior. In my opinion, you have never really seen Yellowstone until you’ve been there in the winter. Over-snow winter travel opens this year on December 15th, so get your plans in order!